"More than 50 per cent of people who stop sport because of tendon pain still suffer from that pain 15 years later," says Dr Ebonie Rio of the Monash University Tendon Research group. "Our simple exercise is revolutionising how we treat tendinopathy." All can testify to the effectiveness of the treatment. 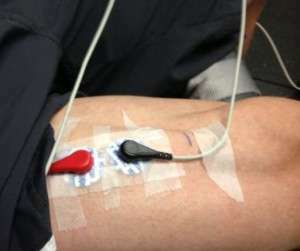 Coined TNT (tendon neuroplastic training), the treatment combines stimulating the brain externally – for example by doing exercises to the sound of a metronome or voice-recording, rather than simply telling patients to hold a pose – with strength training, which is known to be good for tendons and muscles. 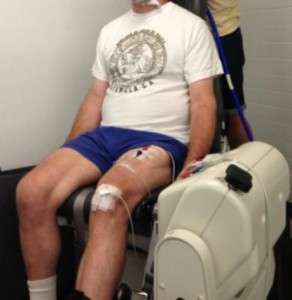 Ebonie and colleagues at the Monash University Tendon Research group found that a single, heavy bout of stationary exercise eliminated kneecap tendon pain instantly, lasting for up to 45 minutes. During the exercise, muscles are 'on' without being extended, and the joint is kept still – for example holding a weighted leg-extension in one spot. Unlike movement-based treatments, which increase tendon pain (and so are harder for people to stick to), this is painless, as well as being medication- and-injection-free. Elite athletes such as the AFL players Ebonie treats can complete TNT during training without worry of muscle fatigue – Ebonie even found the exercises increased muscle strength by 19 per cent immediately afterward. "People with tendon pain have changes to the way they control their muscles, but our current exercises – and how they're taught – don't do enough to address the way the brain talks to muscles. "This may be part of the reason why tendon pain is so persistent and often comes back." But Ebonie says the causes of tendon pain are still unknown, so any insights into the condition are welcomed. "We have no idea what's happening at a tendon level with tendon pain. Despite the fact that it can be chronic and persistent, it behaves quite differently to other types of chronic pain – for example back pain – in that it's very localised within the tendon." 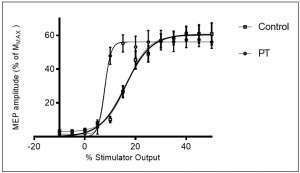 During the stationary exercises, her team also monitored brain activity and were surprised to find high levels of muscle inhibition. "It's as if their brain was trying to limit the use of their quadriceps – the muscles on the front of the thigh," Ebonie says. "We didn't expect to see anywhere near that level of inhibition in people with tendon pain, so that was quite novel." Ebonie's paper on tendon neuroplastic training will be published in the February volume of the British Journal of Sports Medicine next week. Patellar tendon pain is felt at the bottom of the knee cap and occurs in athletes that use that tendon like a spring, for example jumping in ballet, football and netball. Other tendon pain is common in athletes and non-athletes like in the Achilles. After completing her PhD at Monash University, Ebonie has now started postdoctoral studies at the La Trobe Sport and Exercise Medicine Research Centre, where she will test the treatment on other tendons, as well as finding the minimum number of repeats needed to get lasting effects from the exercise. Ebonie is a member of the Australian Centre for Research into Injury in Sport and its Prevention, and the research was partially funded by the Australia Institute of Sport Clinical Research Fund. Ebonie was the Victorian winner of Fresh Science, a national program that helps early-career researchers find and share their stories of discovery. Fresh Science is in its 18th year and is helping to build a cadre of skilled Australian science communicators. In 2015, Fresh Science ran in every mainland state, with 180 early-career researchers nominating for the six Fresh Science events held this year in Melbourne, Townsville, Brisbane, Perth, Adelaide and Sydney. Fresh Science Victoria was held at Scienceworks (media training), Melbourne Museum (schools forum) and the Kelvin Club (public event) and was supported by Museum Victoria, Biomedical Research Victoria and the Office of the Victorian Lead Scientist. People with patellar tendon pain have differences in the way they use the brake & accelerator that drives their quadriceps muscle. It is like they have one foot stuck on the accelerator and one foot stuck on the brake (like a learner driver!) The isometric exercise changes the brake & accelerator to allow them to perform painfree and stronger than before the exercise.